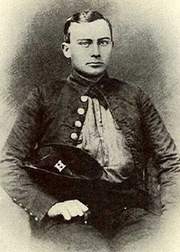 Samuel “Sam” Rush Watkins was a noted Confederate soldier during the American Civil War. He is known today for his memoir Company Aytch: Or, a Side Show of the Big Show, often heralded as one of the best primary sources about the common soldier's Civil War experience. Sam R. Watkins is currently considered a "single author." If one or more works are by a distinct, homonymous authors, go ahead and split the author. Sam R. Watkins is composed of 5 names. You can examine and separate out names.